Start measurements easily by simply clicking icons on the assistant bar in order. The ICPE-9800 series' assistant functions, which combine extensive spectral data with a substantial database, enable easy optimization of methods and a simpler, more efficient analytical workflow. Even after measurements are finished, the elements and wavelengths can be added, which allows you to confirm the quantitative or qualitative data. Because data are acquired for all wavelengths, there is no need to reanalyze samples. The quantitative values can be displayed by simply adding elements or wavelengths. This is especially helpful when you forgot to specify an element to be measured or want to obtain data for other wavelengths. The profiles and semi-quantitative values can be loaded and confirmed for all elements. This is useful for determining the approximate concentrations of elements that were not quantitated, for example to confirm matrices. 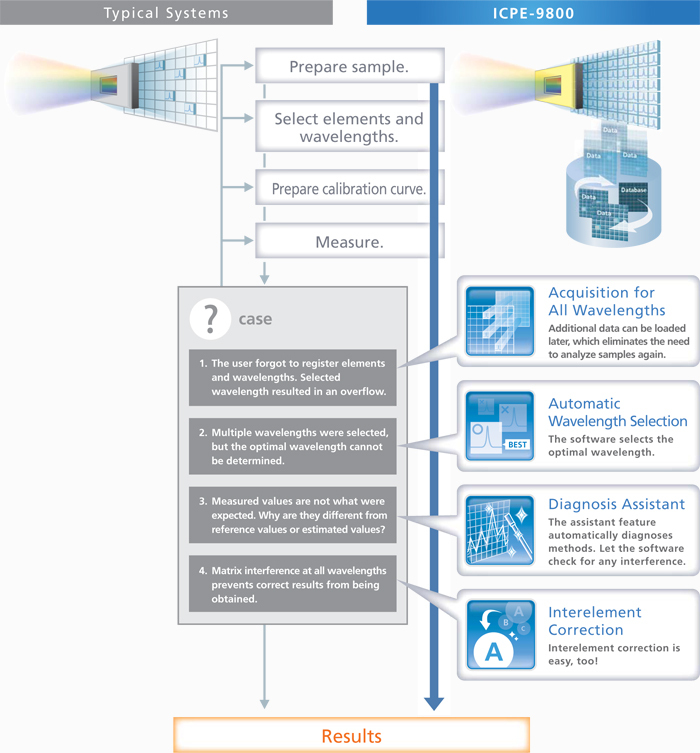 Once data for all wavelengths have been saved, it can be loaded and reanalyzed at any time. This availability of data provides peace of mind in case something unexpected happens with quality control or when analyzing samples that are only available in small quantities. This function automatically selects the optimal wavelengths for the measurement sample based on the SB ratio and whether or not there is interference from the matrix. This function automatically checks for any problems with the method and, if any are discovered, it suggests the best way to resolve them. This allows anyone to quickly obtain accurate analytical values. This function is useful if high-matrix samples cannot be quantitated accurately due to optical interference at all analytical wavelengths. ICPEsolution software allows users to easily perform interelement correction by simply adding a calibration sample for the interfering element to the calibration curve sample. 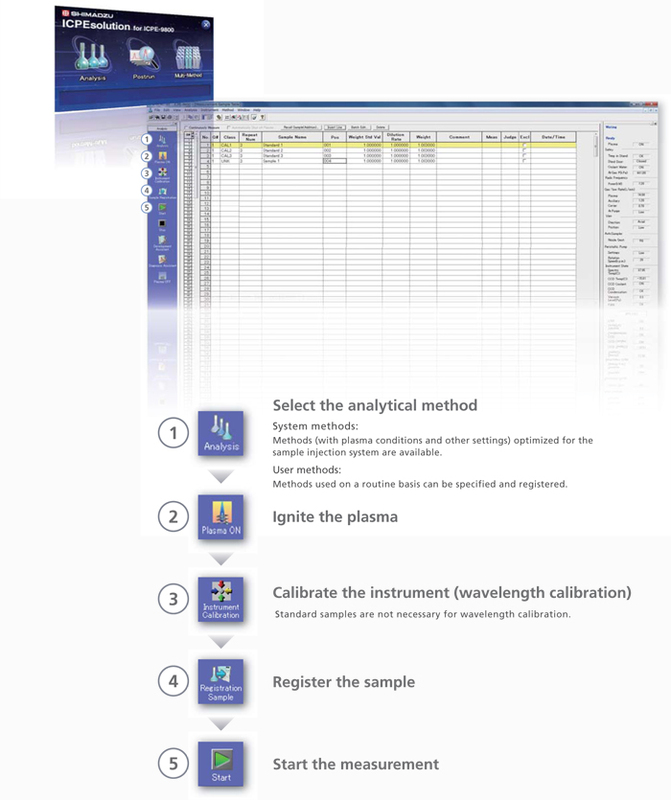 This function uses the results of qualitative analysis to automatically create a method (including wavelengths and calibration curve concentrations) depending on the concentrations of the elements targeted for measurement and the matrix in the sample. User method development can be performed smoothly.